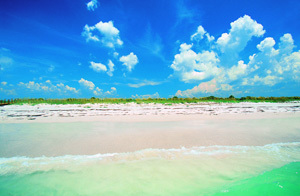 About the Sarasota Beaches, Florida - BeachDirectory.Com - The entire Florida Gulf Coast...in detail! Please note that we only attempt to cover the the Greater Sarasota Area beach communities (Longboat Key, Siesta Key and Lido Key), not the entire Sarasota area. If you want detailed information about the entire Sarasota area, visit the Sarasota County Convention and Visitor Bureau web site. Longboat Key is a sparkling, glorious 10.8 miles (17 kilometer) stretch of land with 8,000 permanent residents. The number swells to several times that in the winter. Half of Longboat Key is in Manatee County (Bradenton area, half of it is in Sarasota County (Sarasota Area). We chose to cover it in this section (the Sarasota section) of our site. For accommodations, visit the accommodations section of our site. The Town of Longboat Key has information of interest to visitors, such as information about parks, nature preserves and the Longboat Key Tennis Center. A detailed community profile is also available from the Longboat Key Chamber of Commerce, with informationon average temperatures, population and age, taxes and much more. St. Armand's Circle, an up-scale shopping center on Lido Key, draws visitors from near and far. In 1885, Charles St. Amand (name misspelled in later deeds) built a home here and claimed his 130 acres of land for $13. Developed into St. Armand's Circle in the 1920's, it sat neglected during the 1930's depression. Most of what is worth saying about the Sarasota area is already covered in the Anna Maria / Sarasota section of our attractions page. The Siesta Key Chamber of Commerce has more information about the area. The City of Siesta Key does not appear to have a website. The Siesta Key Village Association is a non-profit organization and provides a comprehensive list of local activities and events.